A while back I recommended my friend Anton's E-Commerce Drop Shipping training course when it was still called the 4-Hour Millionaires Training Course. The actual content and system was good but his members would always tell him that they felt awkward recommending such a cheesy sounding course to their friends and family. I felt the same as well even recommending it here on my blog and to my friend Elaine. Thank god he changed the name of the course to Drop Ship Lifestyle instead, which I actually helped him pick out. He knew that the system worked and worked well, as there are over 800 active paid subscribers to it, so now with the name change and relaunch it's starting at a higher price point. I hope you guys that were interested jumped on and signed up when I first recommended it because it's a lot more expensive now! The good news however is he also added a ton of new content and the money you'll make back from it is worth the investment. 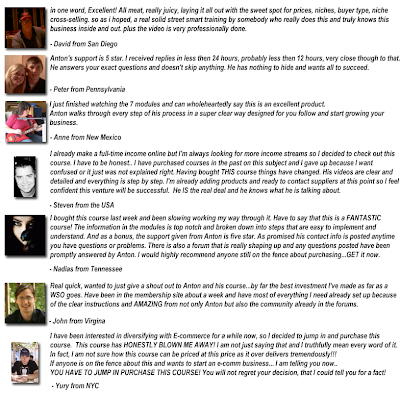 Here's what some of the members had to say about Anton's system. Click to visit Anton's site and read the testimonials. If you wanted to learn Drop Shipping and setting up an E-Commerce business I would highly suggest you sign up for at least the trial now and get started. Follow me on Facebook to keep in touch.